UFW (Ubuntu Firewall) is a simple, easy-to-use, front-end interface to manage Linux iptables firewall. Iptables rules are complicated and UFW is designed to make things less complicated for administrators, that is why it also called Uncomplicated Firewall. In this tutorial We’ll walk through the process of enabling and configuring the UFW on Ubuntu 18.04. we'll walk through a number of examples showing how to open ports, allow IP address, block IP address and reset firewall in Ubuntu. UFW Firewall is disabled by default on Ubuntu 18.04, so we need to enable it, but we need to do it the correct way. The correct way is, first we must add firewall rule to open ssh port 22, then we activate the firewall. If you start the firewall without opening SSH port, we won't able to access the command line remotely. As you can see ufw is now activated, We also have firewall rules that allow incoming SSH traffic both IPv4 and IPv6. At this point our Ubuntu server blocks all incoming traffic except for the SSH. Next, we will see how to open additional network ports on UFW. The ufw allow command adds allow rules to the firewall. To allow incoming traffic from a specific port we can use either service name or the port number. Note that we specified the protocol name when opening the port 80, because it is a TCP port. If you leave out the protocol name, ufw will open a port for both TCP and UDP protocols. The preceding rule will open DNS port 53 for both TCP and UDP protocols. The Ubuntu UFW firewall can allow/block incoming traffic based on the client IP Address or Network. For example, following firewall rule will allow all traffic from the from the 192.168.1.10 IP Address. Note that "to any" means, to any interface on the server. If you want to remove all firewall rules, run the reset command. The reset command Disables and resets firewall to installation defaults. UFW, also known as uncomplicated firewall, is the default front-end command line tool to manage iptables on Ubuntu 18.04. 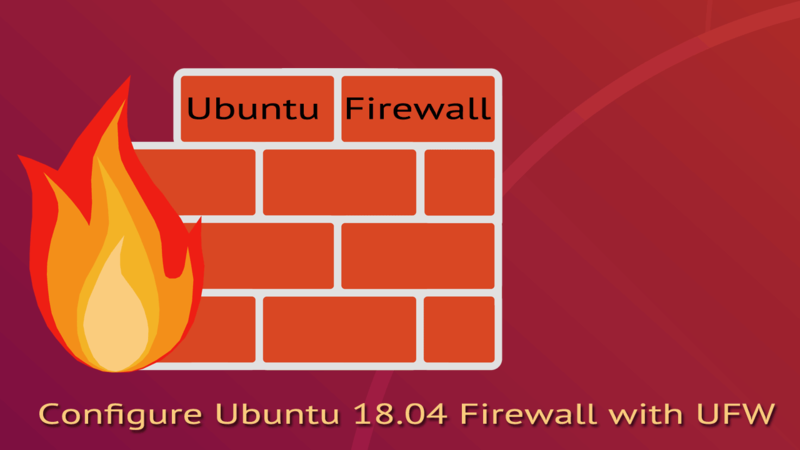 Ufw Firewall is disabled by default in Ubuntu 18.04 and we must open the ssh port before we enable the firewall. Otherwise, we will not be able to access the command line remotely once we exit from from the current ssh session.